I am such a demick. 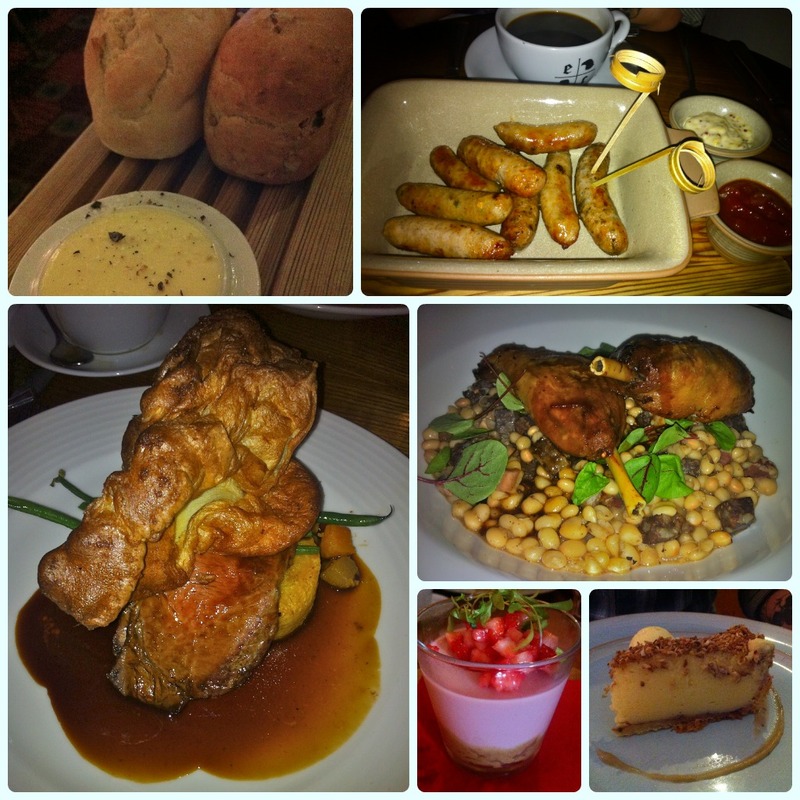 A couple of months ago we went to the Eagle and Child in Ramsbottom for the first time. We loved it so much, we went again a couple of weeks later. I thought I had already written about this, but clearly I was blinded by excitement and completely forgot! We had driven past this building countless times en route to either Park Farm or the Fisherman's Retreat. It always looked a little bit shabby and unloved (think Trampy from the Shoe People). Not long after, metal shutters were put up and the gardens became overgrown. A sad story indeed until there were signs of life once more... Within a few weeks we noticed that the Eagle and Child was open for business. It can't have been long after that when a friend at work asked if I had been yet. She had been with her family and insisted that I go to sample the 'weird dessert'. She said it was tiramisu in a unique form. She wouldn't tell me any more than that! My first guess was wrong. I can probably bet a tenner that yours is too... I heard they grew their own vegetables and had some chickens too. Sold to the greedy girl! I would definitely recommend booking. We turned up without a reservation at about 5.30pm on a Friday and got the last table! There is a small onsite car park, but there are some bays off the main road opposite the pub too. We were both hungry like the wolf when we arrived, so thought we would get some nibbles whilst we waited for our mains. Nibbles. 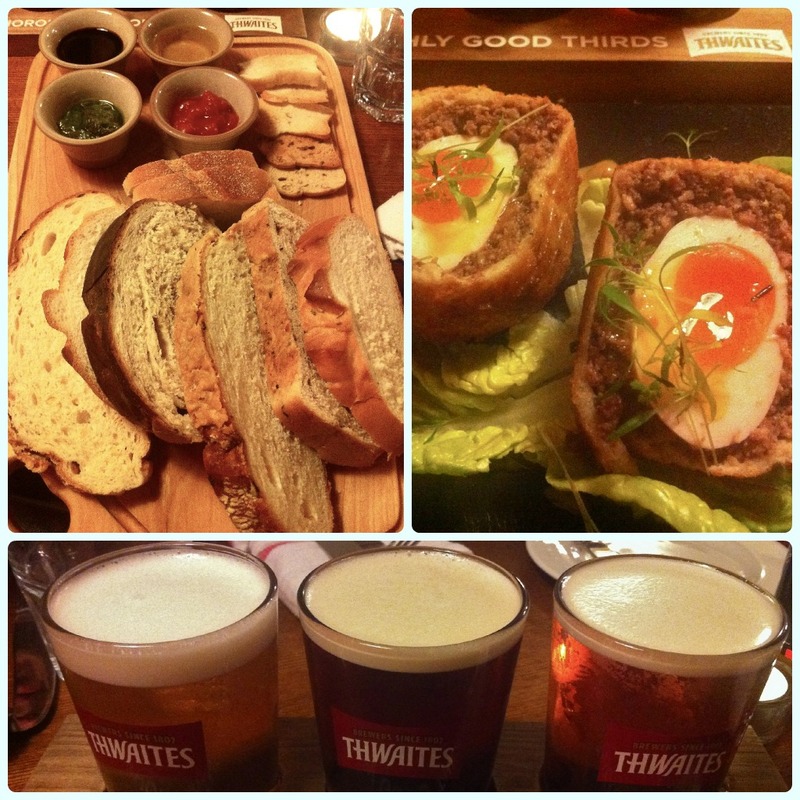 The pictures below show the massive bread board and scotch egg we ordered. My husband also had a beer tasting board! We were pretty full by the time we had polished these - yes, we ate the lot. The bread comes with some beautiful tomato relish, pesto, oil and balsamic vinegar. The scotch egg is accompanied by home made piccalilli. All nibbles should take this form... So much bread... So happy. By the time our mains arrived we were suffering a little. But then we saw them. I chose the gammon steak with egg and chips (one of my all time favourite foods) and my husband had the steak and ale pie. Portions are generous with emphasis on flavour rather than fluff. Attention to detail in a rustic form; the food was well seasoned and tasted fantastic. It's weird how that full feeling can conveniently leave you the second something mouth-watering is put in front of you. By now we were suffering from mild death, having devoured what felt like all the carbs in the world. But then I remembered. The tiramisu... Now I cannot stand coffee flavoured things. Except coffee. So I did what I had to do... I made my husband order it. Sorted. I on the other hand decided that sticky toffee pudding and ice cream might just assist in settling my already bursting stomach. Sure enough, several 'oohs' and 'ahhs' piped up when a little plant pot arrived at the table. This was not the shape I had imagined... After all, this is a family restaurant. In my defence, she had built it up to be something outrageous! The menu should have given it away, describing the dish as 'terramisu'. This was a creamy coffee flavoured dessert topped with crumbly chocolate (possibly cake...) and a few leaves and flowers. Simple yet rather amusing! My sticky toffee pudding was a dense, sticky pile of wonder. As Mary once said, practically perfect in every way. I'm confident I could drink a pint of that toffee sauce. We hit it off with the Eagle and Child. A relaxed atmosphere with excellent food and chatty staff. We couldn't wait to go back! So, a couple of weeks later we rang them on a whim to see if they had any spaces for Sunday lunch. Bingo! We decided to try different nibbles this time, so got a sausage sharing platter between us. The 'snag bangers' come with tomato relish and grain mustard mayo. You also get two mini loaves and butter as standard if you don't order the bread board. Just as wonderful as the pictures suggest. There was never any doubt that I would have the beef roast, but my husband decided on the duck legs with white beans and black pudding from the specials. 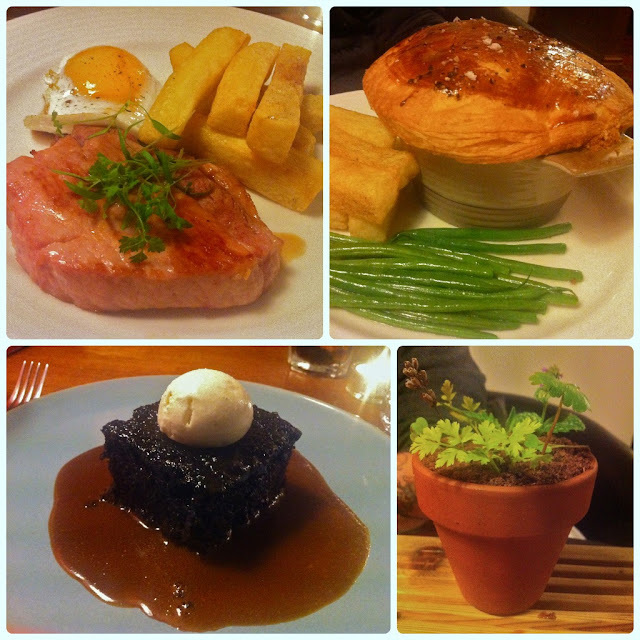 We had a fantastic meal first time round, but this time was arguably even better. I got a huge piece of beef rib with a gargantuan Yorkshire pudding. Hiding under this is a pile of veggies and assorted potatoes. For dessert we had a Manchester tart and a strawberry cheesecake. God that cheesecake was out of this world. It was dense in texture and had a wonderfully strong strawberry flavour. I was devastated that I left a tiny bit! I urge you to try the Eagle and Child. Yet another wonderful eatery pops up in Ramsbottom, and gives me another reason to visit this bustling little town regularly. Now that's a scotch egg! Looks like the portion sizes are huge! !